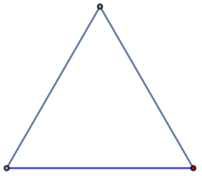 yields a graph with edges ej. 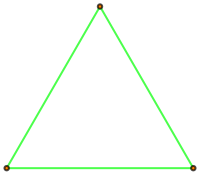 yields the graph with vertices vi and edges ej. 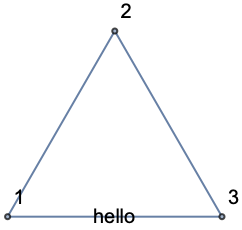 yields a graph with vertex and edge properties defined by the symbolic wrappers wk. Graph[…] displays in a notebook as a plot of a graph. Graph[…] is always converted to an optimized standard form with structure Graph[vertices,edges,…]. Graph is treated as a raw object by functions like AtomQ, and for purposes of pattern matching. An undirected edge between u and v can be given as uv, u<->v, UndirectedEdge[u,v] or TwoWayRule[u,v]. The character  can be entered as ue . 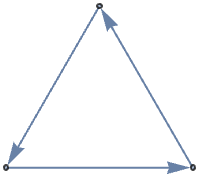 A directed edge from u to v can be given as uv, u->v, DirectedEdge[u,v], or Rule[u,v]. The character  can be entered as de . An undirected graph is specified using a collection of undirected edges. 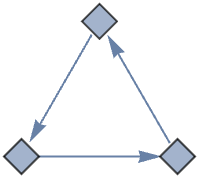 A directed graph is specified using a collection of directed edges. The possible label placements are given in VertexLabels and EdgeLabels, respectively. Possible settings for PlotTheme include common base themes, color feature themes, font features themes, and size features themes. With the setting VertexCoordinates->Automatic, the placement of vertices and routing of edges is computed automatically, based on the setting for GraphLayout. Style and other specifications for edges are effectively applied in the order PlotTheme, EdgeStyle, GraphHighlightStyle, Style and other wrappers, and EdgeShapeFunction, with later specifications overriding earlier ones. Style and other specifications for vertices are effectively applied in the order PlotTheme, VertexStyle, GraphHighlightStyle, Style and other wrappers, and VertexShapeFunction, with later specifications overriding earlier ones. Label style and other specifications for edge labels are effectively applied in the order PlotTheme, EdgeLabelStyle, GraphHighlightStyle, Labeled, and EdgeLabels, with later specifications overriding earlier ones. Label style and other specifications for vertex labels are effectively applied in the order PlotTheme, VertexLabelStyle, GraphHighlightStyle, Labeled, and VertexLabels, with later specifications overriding earlier ones.